I found a link today to the facebook page for an editor of Midwifery Today (Jan Tritten), a trade magazine for direct entry midwives. 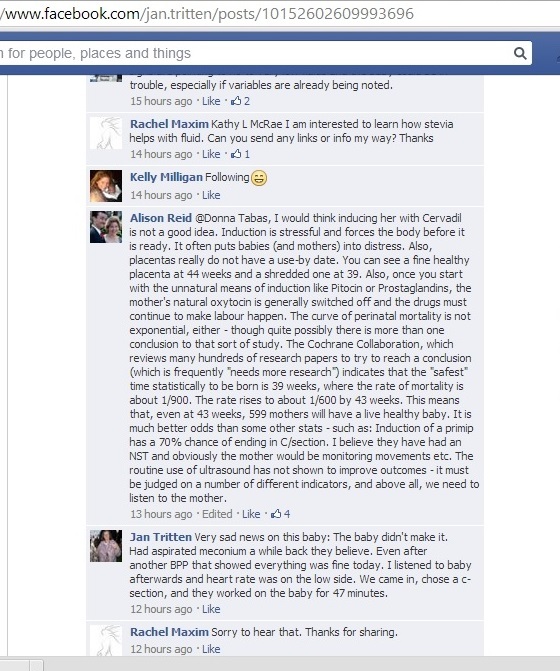 She makes a habit of posting questions on behalf of other midwives. I assume she does this because midwives may not want their names known when asking about dangerous practices OR because Jan has more friends and will therefore get more responses to questions. It seems that she was posting about her own client this time. Note the part on the first post that says “We’re in a state with full autonomy for midwives and no transfer of care regulations past 42 weeks”. What does ‘full autonomy’ mean? Its midwife speak for “no rules to protect patients from negligence”. Utah is a state that lacks these protections for mothers and babies. This could be a death here or in Oregon- it is not possible to know, however Oregon does have more restrictions on unlicensed midwives than Utah does. In Utah, a midwife can do whatever she wants to unless she voluntarily decides to get licensed. The law is very misleading to the public- if you look up the law about midwifery in utah it looks as though there are strict practice guidelines, but they only apply to women who volunteer to abide by them. If those women lose that license they can still practice afterwards, with fewer restrictions. They cannot call themselves licensed midwives, and they are not supposed to carry drugs, but when I tried to report an unlicensed midwife claiming to be licensed there were not any consequences. Utah midwives (licensed or not) don’t carry insurance so if they injure or kill someone the grieving families are unlikely to be able to sue, and if they can sue they are unlikely to collect any money. What reason is there for the midwife to act differently? There is no negative consequence for depraved indifference and a lot of praise for delivering high risk clients to ‘prove’ that birth is inherently safe. You can see from the comments that virtually every other midwife seems to act like this was an unforeseen tragedy that could not have been helped. There were multiple, glaring indications for transfer and the midwife did nothing. Other midwives in the comments talk about the importance of midwives setting their own standards of practice, when in fact that is exactly what caused the death. 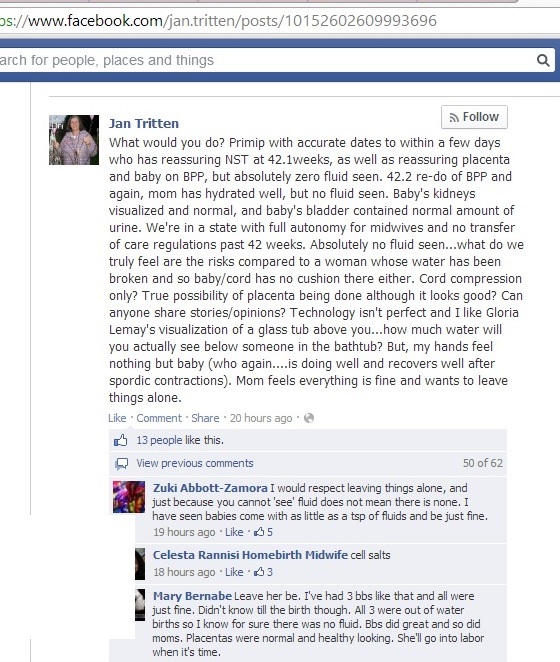 Jan Tritten is the editor of the trade magazine for midwives, and she engages in behavior which enables dangerous practices like this to happen. Why is she not ashamed? Something similar happened in Utah awhile back. It was another case of depraved indifference to the wellbeing of a mom and baby, and it ended in a death. What consequences were there for that midwife? The harshest consequence I’ve seen for a midwife in Utah was to be charged with negligent homicide, and then be sentenced to probation and banned from attending births. That’s it. Probation. She wasn’t even shunned by the community in the aftermath, they embraced her and probably still do (while the public isn’t watching). One of the main reasons Utah’s state laws are set up this way is because of legislator Holly RIchardson (republican, of Holly on the Hill fame). She was instrumental in getting the original direct midwifery act passed as legislation, and has yet to take any responsibility for the outcome of such an outrageously negligent policy. Even if this death was not in Utah, there is absolutely nothing that would have prevented this level of negligence from happening here. 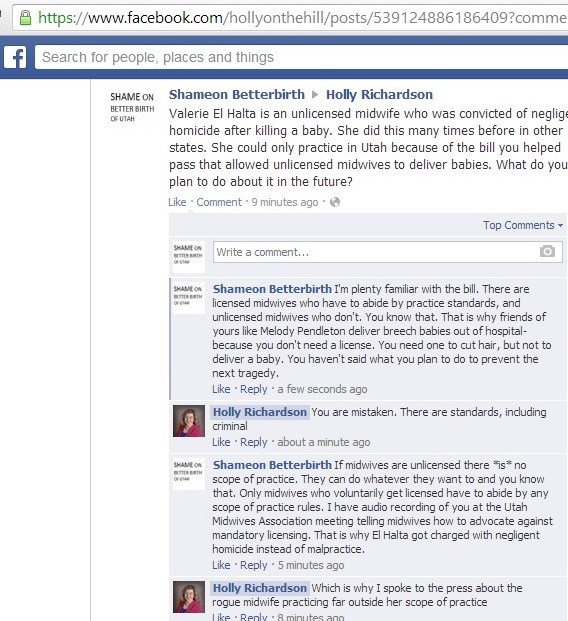 There is absolutely nothing in place to punish or discourage this level of negligence by unlicensed midwives, and that’s the way Holly Richardson and her friends at the Utah Midwives Organization prefer things to be. Without new legislation we are literally waiting around for this to happen again. How many dead newborns will it take for people to demand change? Holly is running for House District 57 in Utah this election. Let Holly know how disgusted you are at her for enabling dangerous quacks to operate without any accountability. Her contact form is here. Edited to add- there are actually multiple states with lax licensing on midwives. Read the comments for additional information. In the end it turned out that this tragedy happened in Nevada. 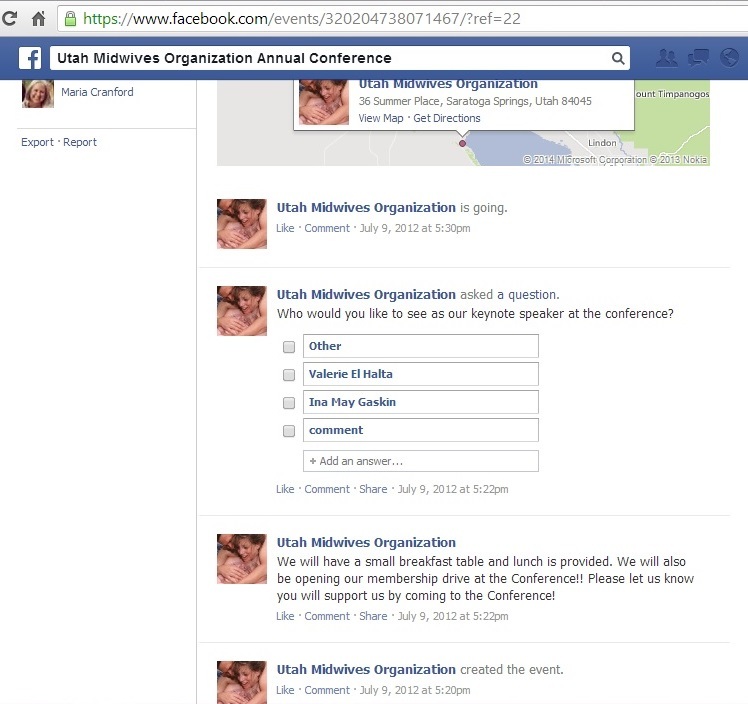 I found the recording of a meeting of utah midwives after the preventable death of a baby at the hands of a serially negligent midwife (Valerie El Halta). This post aims to summarize the meeting (click this link to listen). I have it saved on my computer if they decide to delete it. Descriptions of the meeting are in bold, my commentary is in normal text. The first 6 minutes is murmuring and obviously not the meeting itself. You can skip it. Tara Tulley leads the meeting with a statement, and stresses repeatedly that the meeting is being recorded and the media might get their hands on the tape because it will be posted online later. She starts the meeting by talking about how she doesn’t want to discuss the charges against the midwife, just how she wants to gear up the community to prevent any legislation from restricting a midwifes ‘freedom’ to practice without any licensing. When a preventable death occurs in a hospital, there is usually a case review where people get together to try and figure out what they can do to prevent it next time. Here we see midwives behaving as the opposite of medical professionals, as these midwives are only seeking to defend their income source. This has nothing to do with the freedom to birth at home, because women are free to do that in many other states that require licenses for midwives (meaning every state except for Utah). It is about the freedom of midwives (sometimes self proclaimed, under qualified midwives) to conduct births however they please without having to face any consequences for the outcomes. Around 13 minutes Tara says she wants a midwives organization to exist so that they can ‘develop standards of practice’. She wants to be able to say “look we are organized and have a standard of practice” when legislators come after midwives the next time a baby dies or is permanently injured. The unstated assumption is that all these midwives know that another midwife is going to kill someone negligently, so they need to be prepared when it happens again. Tara stresses how important this is to unlicensed midwives, how important it is to ‘keep that option open’. I’m sure reckless people would very much enjoy keeping an option open that would let them do whatever they want to. Around 17 minutes in she discusses ‘relative conformity’, meaning that they need a standard that most people can agree on but that midwives don’t actually have to adhere to 100%. This is the opposite of an effective standard of practice. I cannot understand why anyone would need to profess their love for Teresa El Halta just because they work in the same profession. The woman is a reckless killer who has wronged countless people over the years. She has a pattern of using interventions that she is completely unqualified and untrained in, as well as doing forced vaginal exams and procedures all while taking on extremely high risk cases. Then she moves to a new state when she gets in trouble. Tara agrees and with the “open our hearts” comment, then talks about how important it is to manage public perspective on “events like these” (meaning the needless death of an innocent baby). They are clearly more worried about appearing a certain way that actually preventing future deaths. El Halta would not have been able to become a licensed midwive in Utah because she had her NARM certification revoked. That can only happen if two separate people manage to file complaints against a single midwife. NARM gives grieving mothers the run around, so it is really a testament to how terrible she was at her job that NARM formally revoked her midwifery certificate. These midwives, who are supposed to uphold the well being of infants and pregnant women, don’t want anyone to hold them legally accountable for what they choose to do. They want the appearance of accountability by having their own group, but they are not capable of meaningful legal action. Don’t be fooled by any by laws or standards of practice that are demonstrated by UMO- they don’t mean anything when there isn’t a real consequence for violating the rules. Getting kicked out of UMO would not make someone unable to practice in the state, so what good would it do for patients? None, really. It benefits midwives exclusively. A BABY WAS KILLED BY A MIDWIFE. AND YOU ARE WORRIED ABOUT KEEPING THINGS THE SAME? No normal person reacts to the death of a baby this way. I don’t know what is wrong with these women, but they should not be tasked with governing themselves. Stay tuned for part two later this week. 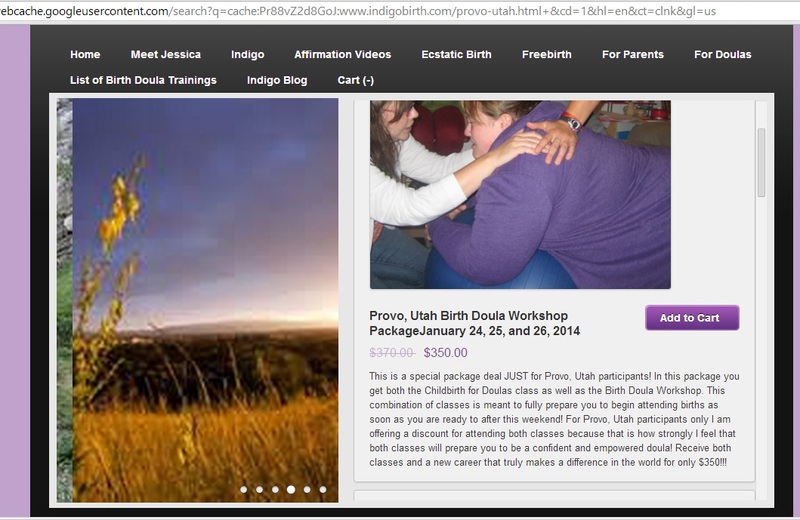 I have had some serious problems with the Utah Midwifery/Natural Childbirth Community. The most serious problem is the death caused by a negligent midwife in 2013. NOTHING has been done to prevent this from happening again. Valerie El Halta came to Utah to be a midwife because she had killed in other, less lenient states, and found that Utah was the most hospitable to someone like her. It is that way because the direct entry midwifery act does not adequately control the conduct of midwives, and in fact actively encourages negligent midwives to come to Utah. Utah is the only state that still has voluntary licensing. 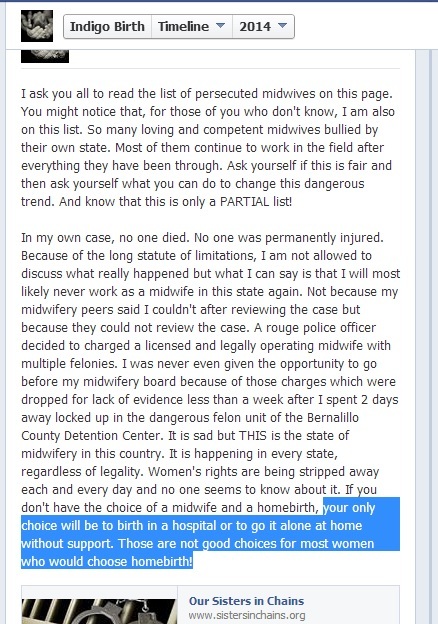 Being an unlicensed midwife means you aren’t accountable to the state at all. Oregon used to be a voluntary licensure state until they too learned the hard way that letting unlicensed midwives legally operate is a recipe for multiple deaths. Something must be done to stop this before someone else dies. What does the utah midwifery community do about these problems? I’ve already covered the defensive action taken by the Utah Midwives Organization in the wake of a preventable death- they were much more concerned about protecting themselves than preventing another death. What I did not know until recently is that a woman with significant political clout was part of the group. Holly Richardson is running for house distric 57 in Utah, and has been in office previously. What did she have to say about El Halta’s dangerous practices? Former state Rep. Holly Richardson, a midwife of 14 years, played a key role in getting the Utah Legislature to pass a law in 2005 that set up guidelines for certifying lay midwives. With certification, midwives in Utah may administer a limited number of prescription drugs and perform certain prenatal care duties. Midwives can still be unlicensed in Utah and legally assist with a delivery, Richardson said. But those births are typically very natural. In the case of the Moab mother, Richardson said, ElHalta should never have attempted to deliver the baby outside a hospital. Holly Richardson talks about this incident like it was an anomaly, that no one could see this coming. Anyone could have seen this coming if they knew El Halta’s history. The scope of practice outlined in the direct entry midwifery practice act is not something that can actually be enforced if a midwife is unlicensed, so it was meaningless. Other midwives, like the vice president of the Utah Midwives Association (Tara Tulley) know that and prefer for unlicensed midwives to be able to take on cases that should never be considered for home birth. Of course, Tara also believes that a firm talking to is a better solution for negligence than legislation, so you can’t expect her to make much sense. She is also an aspiring politician and the owner of a midwifery school in Utah. Holly Richardson has blood on her hands. 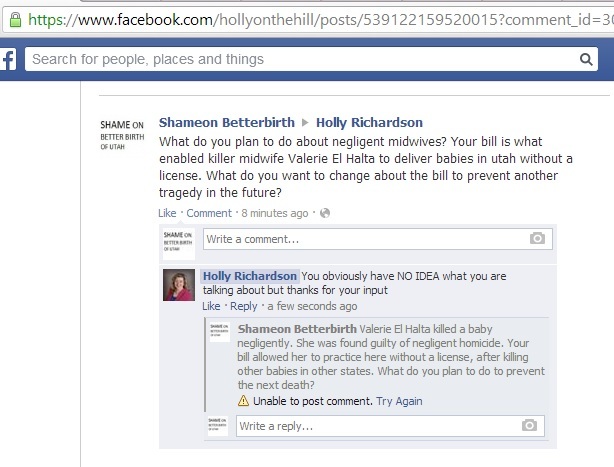 She pushed for a bill that allowed this to happen, that made Utah very attractive to a person like Valerie El Halta, who wanted to avoid any accountability for her actions.She is part of an organization that actively opposes legislation that would prevent another tragedy, then refused to take any responsibility for the outcome of her actions. She claims that no one would take these clients on, but there isn’t anyone to regulate who unlicensed midwives can or cannot take. We are supposed to trust a bunch of unaccountable strangers to accurately judge who is a good candidate for homebirth. If you look on the “issues” page for Holly Richardson, there is nothing to be found about midwives or legislation of midwives despite her role in crafting the law and the deadly result of it in the past year. Instead of working to prevent deaths she gave a seminar to the Utah Midwives Association on how to be influential in local politics, to protect themselves from the hassle of having to be licensed. Its ridiculous- every other sort of birth attendant has to have malpractice insurance and current licensure to prevent deaths (and compensate others when mistakes are made). Midwives do not have to carry insurance and they are complaining about being held accountable at all. These women are a public health menace that absolutely needs to be addressed. It is apparent that they refuse to properly regulate themselves. I’m not content to sit by and wait for someone to have another dead or brain damaged baby at the hands of a ‘professional’ midwife. 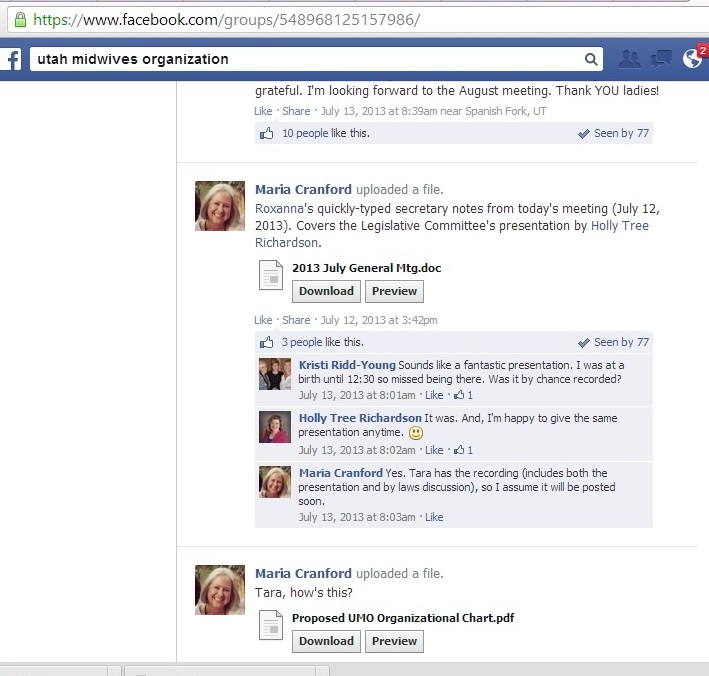 I have a lot more that I have found that needs to be exposed regarding Holly Richardson and the Utah Midwives Association, but I need to organize all the evidence I have downloaded and saved. Stay tuned for more in the next couple of days.